“Grampy, there was a deer in the garden last night.” His wrinkled and impassive face was transformed instantly, and his eyes grew alive with excitement. Grampy often walked with a cane, but he practically leaped from his rocking chair and told me to show him. No one liked venison and harvesting and processing deer like my grandfather. I think I was born knowing that when someone in the Fowler family shot a deer, it was automatically Grampy’s deer. 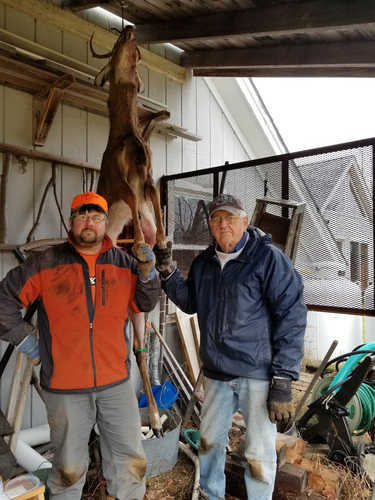 Grampy decided where the deer would hang and how long it would age before being cut up. He produced the knives, meat saw, and cleaver; he supervised cutting up the deer; and, with the exception of the neck which always went to my grandmother Kate for mincemeat, Grampy controlled the who and when for the distribution of the meat. Although I didn’t openly question the system, I remember thinking it odd that the person who actually shot the deer often was well down the line for being given meat. Grampy, Albert F. Fowler, was a grandson of Betsey and Thomas Fowler who traveled by ox team in the winter of 1829 with their children through virgin woods to the lower West Branch of the Penobscot River. As the area’s pioneer family, in order to provide for sustenance, it is likely that Betsey and Thomas took advantage of pasture protein that was not limited to fenced-in animals. It is absolutely known that the diet of succeeding generations included a lot of protein from the woods and waters surrounding Norcross. I don’t know whether he was influenced by multi-generational family tradition or not, but Grampy had a particularly powerful passion for venison. The big game of Maine was once piled like cordwood on the platform of the Bangor and Aroostook Railroad Station at Norcross, positioned for shipment south after having been shot by successful sportsmen. The little village was a major exporter of moose, bear, and deer after the B & A Railroad reached the area in 1893. In fact, for a number of years, according to the railroad’s publication, In The Maine Woods, more big game was shipped through the Norcross Station than any other on the B & A line. My Great-Uncle Blaine Crocker was the kindest and calmest man I ever knew. He had a perpetual smile and a continuously peaceful countenance, and I loved having Uncle Blaine and Aunt Florence come to visit. I suppose one of the reasons I loved the Uncle Blaine hunting story is because it always seemed so surprising that the Uncle Blaine I knew was a renowned hunter. Whenever I was in the woods with my father or grandfather and we’d hear one lone rifle shot, they’d always say, “I guess Blaine is in the woods with us today.” This is my father’s story of One-Shot Blaine. When he was about 14, Dad said he was home from school at Higgins for Thanksgiving, and he went hunting into Quakish Brook with Uncle Blaine. They had hunted all the way to the logging camp and, still hunting but following a separate route, had just started back to Norcross when my father heard three shots. He knew it was Uncle Blaine but was puzzled. Everyone knew about One-Shot Blaine. Dad slowly headed in the direction of the shooting, and he found Uncle Blaine sitting on a stump smoking his pipe. The answer to the mystery was revealed! A short distance away three dead deer lay so close together that they could be covered with one blanket. Two deer were given to the logging camp cook, and the other was taken back to Norcross the next day. Three shots, but he was still One-Shot Blaine. My own hunting began at a very early age. Squirrels, partridge, and rabbits were the game I first remember hunting by myself. By the early 50’s, my constant deer-hunting companion was Grant MacKay. During deer hunting season, we were pretty much inseparable. In those days, Great Northern Paper Company owned almost all of the land around Norcross, and because they generously shared their land with sportsmen, Grant and I had a hunting pasture every bit as large as that of my great-great grandparents 120 years previous. In fact, it was likely larger. Besides hunting anywhere our feet would take us, we also used motorized boats and vehicles to increase our range. By the time we graduated from high school in 1960, Grant and I had built two hunting camps from salvaged lumber. One was constructed upstream from the Quakish Brook Dam with the remains of a large logging camp complex, and the other was created at the foot of North Twin Lake from shore salvage and Great Northern canvas. Both structures are still somewhat standing, and when I visited the North Twin Lake camp in the summer of 2017 with my daughter Christine and grandson Theo, an avalanche of memories flooded forth. We went back to the campsite, got fully dressed, picked up our shotguns, and sneaked along the upside of the dam to the other side of the stream where there was better cover. I don’t think we had a plan or an objective; the events just unfolded. After a bit of time, I suppose we were just seeing how close we could get to the moose before it saw us. It was a healthy looking bull with an impressive rack - not huge but certainly a very large moose. Eventually, we developed a rhythm, moving only when the moose’s head was submerged. As luck and fortune had it, the moose continued to move downstream and kept getting closer to the edge of the shore. And then we noticed the room-sized rock. Just as the moose disappeared behind the rock, Grant scaled the opposite side, and I followed. We waited until we heard the sound of cascading water, which meant the moose had raised its head to look around and get some air. Grant was able to make his final move at just the right time as the moose’s head went below the surface on the way down. I grabbed his hand, providing the counterweight, and Grant leaned way out. He extended his 20 gauge and firmly barrel-tapped the moose’s right rump. The air and the water exploded! The moose’s head rocketed out of the water. Every part of him was moving at once as he plowed powerfully across the brook, creating a substantial wake. Not even pausing as he reached the opposite shore, he lowered his head and bulldozed a fairly clear walking trail through the alders and scrub growth. It soon moved out of sight, but we continued to see an occasional movement among the tops of the trees. We knew we had seen an unusual happening, and I am sure that the moose never did understand what that happening was. In reflecting on our deer hunting time together, especially when we were very young, I am immensely grateful for the freedom Grant and I were given and the trust and confidence that our parents had in us. Being allowed to learn to trust ourselves and to trust and follow our magnetic and moral compasses would not have been nearly as effective if we had been receiving constant direction and guidance onsite from others. We shot a lot of deer together, but our biggest success was in building, and cementing, a strong and lifelong friendship. This past fall, I went hunting with my son Tom a few times, and at the end of our last day, he shot a nice 8-point buck. It was special to share that experience with him and help him clean and drag out the deer. Later, Tom texted the success to Grant and then they talked about it on the phone for an hour. Hearing about their conversation made me feel especially good. Oh, by the way, in the evening of that 67-year-ago morning that I showed my grandfather where the deer had been in his garden, we loaded a nice spikehorn onto the front bumper of his old 1928 Dodge sedan.